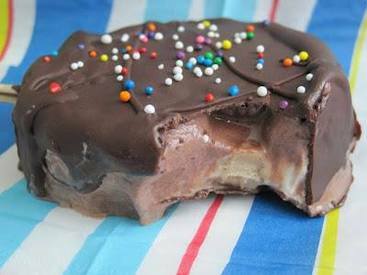 Chocolate covered ice cream bars! Happy National Chocolate Ice Cream Day! Mmm. Pretty simple...melt some chocolate with a bit of oil to keep it liquid, cut up a pint of ice cream, stick in some sticks, dip in chocolate and freeze. I did make a slight modification. I tempered my chocolate first so they were all nice and shiny!